FlowerFresh makes ordering flowers extremely easy for you, you can pick your flowers by type, color, price, occasion or floral design style. Our sophisticated website navigation makes the buying process customized to your needs, to make your decision making process as effortless as possible. You can read about all the different flower types and meanings, and what flowers are ideal to give on a certain occasion in our Flower Guide section. FlowerFresh will send flower bouquets to anywhere you would like, always the highest quality fresh flower s at the best possible price. Arranging a Hand-tied Flower Bouquet – As the name suggests hand-tied bouquets are made by holding the flowers in ones hand and adding each flower at a particular angle to create an organic round looking bouquet, which has an elegance and natural charm to it. Hand-tied bouquets are the predominant bouquet making technique in Europe, and are the preferred bouquet style for all European florists. 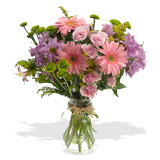 We have a variety of hand-tied bouquets in an array of colors and floral design styles. We recommend that you leave the bouquet tied as it retains the look better, however if you wish to untie your hand-tied bouquet to re-arrange the flowers as you choose, this is fine too.